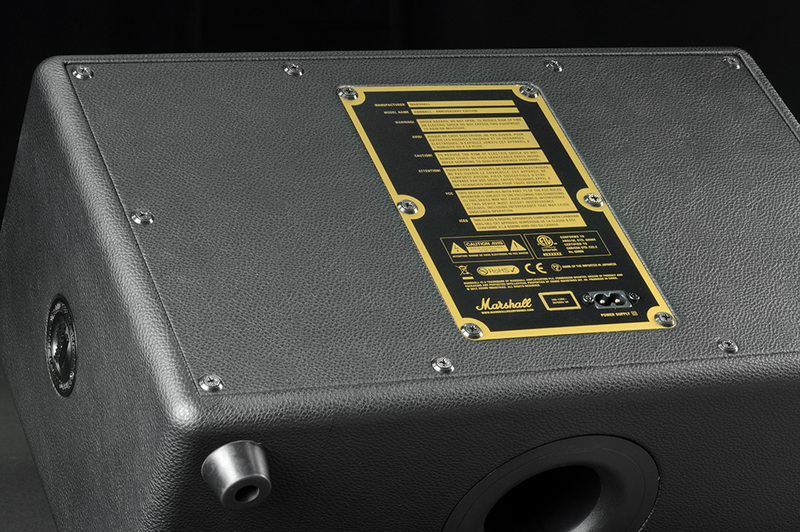 Marshall’s Hanwell speaker “goes to 11” in terms of its sound quality, but it’s lofty price and lack of features will be a deal-breaker, even for the enthusiasts it was designed for. 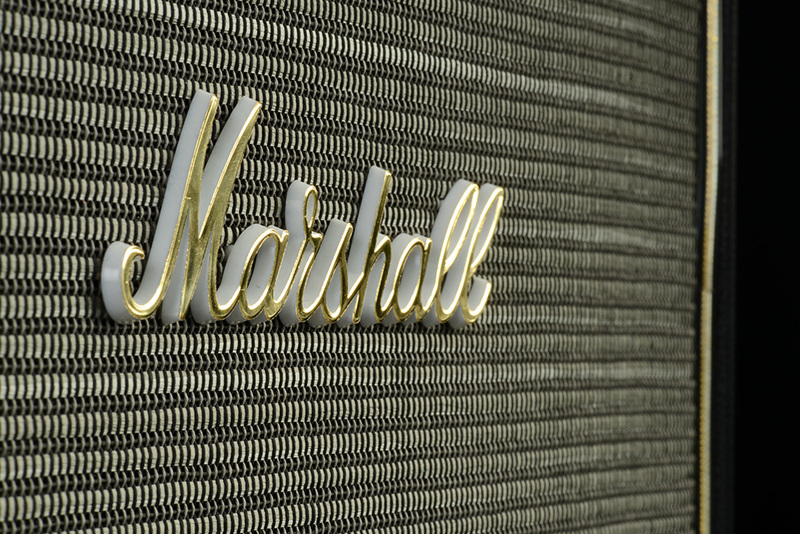 For 50 years now, Marshall has been creating amps and speaker cabinets, forging a presence that has made its name synonymous with rock ‘n’ roll itself. Chances are, you are pretty familiar with Marshall – anyone who has been to a couple of rock shows in their lifetime has most likely seen its name stenciled in white across the front of the towering quartet of jumbo-sized speaker cones known as the Marshall Stack. A staple of many lead guitarists and bassists, the Stack has countless variations, and has become as much a fixture of rock as the Fender Stratocaster or leather pants. The Stack, and Marshall’s countless other amps and speaker cabinet combinations, have been blasting rock fans with face-melting power for decades. 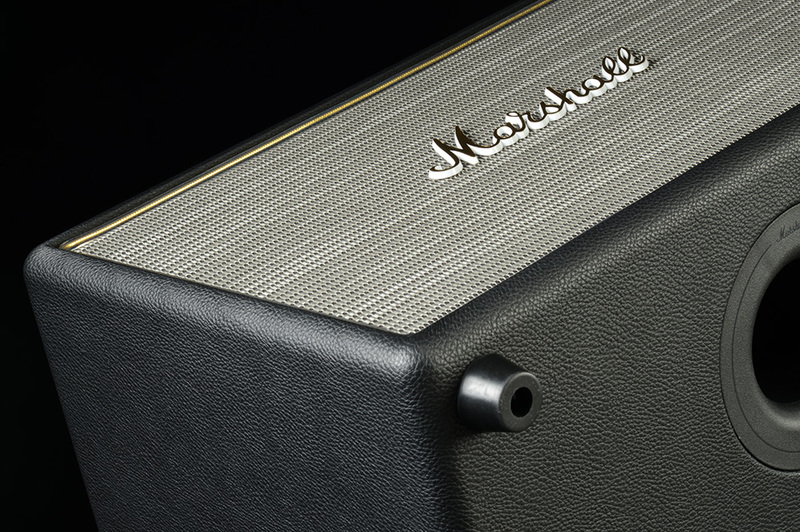 That’s why we were a little giddy when we received the Marshall Hanwell speaker cabinet. Created specifically for Marshall’s 50th anniversary, the Hanwell aims to bring the Marshall sound experience off of the stage and into the home. With its gleaming brushed metal paneling, smooth control dials, and woven cloth speaker screen, the Hanwell is like nothing we’ve seen before in the “iPod dock” category. Unfortunately, the Hanwell stands alone in a less admirable way: it’s priced at around $800! On top of that, the Hanwell’s retro styling excludes many of the features we’ve come to expect from speaker docks, such as Bluetooth wireless streaming, a charging station, and a remote control. We wondered: Could this little box create a user experience memorable enough to overcome these obstacles, making it the must-have collectible Marshall hopes it will be, or would it fall short? We had to probe deeper to find out. As we removed the stout little 23 lb. unit from its box and black cloth cover, we got our first glimpse of the smooth black vinyl and outlined gold accents across its surface, immediately invoking quality and classic nostalgia. In the box with the speaker was a guitar-style, 3.5mm coiled cable. 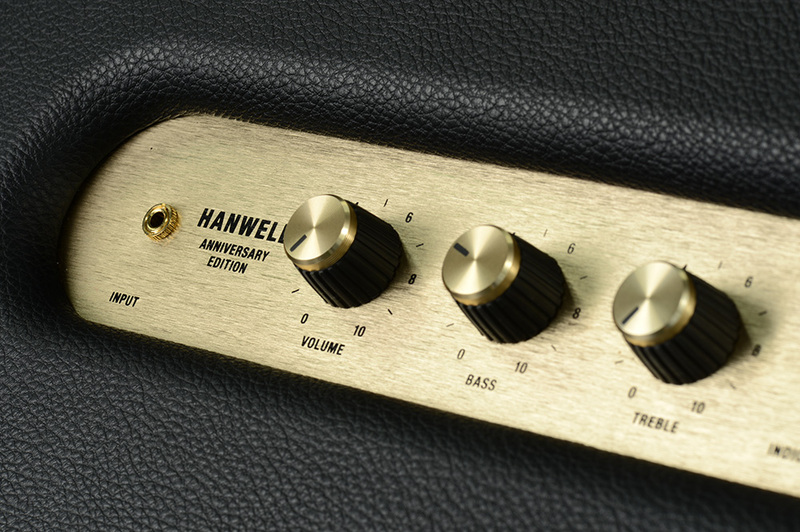 As we said, the Hanwell was designed specifically to commemorate Marshall’s 50th anniversary, so it is flush with gleaming gold accents. On the top of the cabinet is the control panel, consisting of three robust, smooth-turning dials for volume, bass, and treble, a power switch, a 3.5mm input, and a brushed metal back panel, all laden with gold finish. There is also a bright red beaded power light, and that gold-tipped accordion style ⅛ inch cable we mentioned, helping to recall a 70’s guitar amp vibe. On the face of the Hanwell is a corrugated black and white cloth speaker grill, accented with a smooth gold line around the edges. The obligatory Marshall autograph across the front of the screen trades the usual marble white finish for, you guessed it, bright gold embossing. 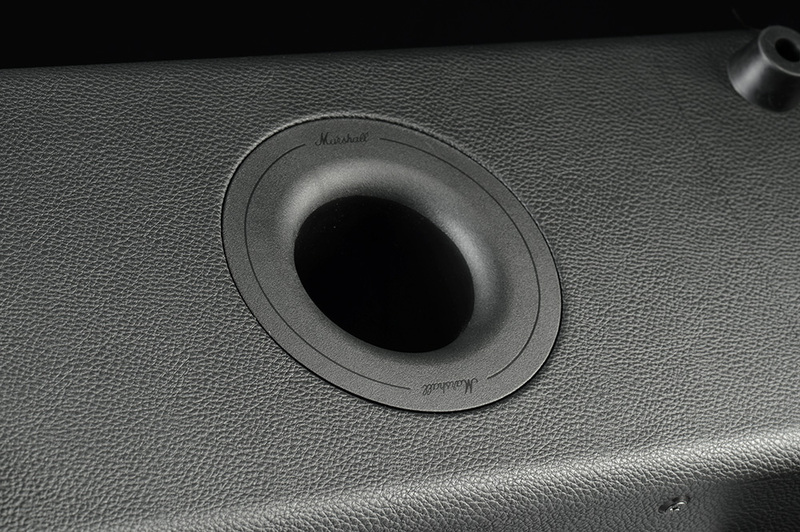 Beneath the screen are four powerful drivers, including two 6-inch speakers, and two ferrofluid-cooled dome tweeters. For those unfamiliar, ferrofluid is a liquid added between the magnet and the voice coil of the tweeters, designed to make them less susceptible to overheating, and able to withstand higher power output than regular tweeters. The four drivers are powered by a “cool-running” 100 watt amplifier, and a small air port on the bottom of the cabinet completes the design. As we said, the Hanwell offers a very limited feature set when compared to its competitors. Though we appreciated the classic styling, it was a little strange in this age of supreme technological convenience to be forced to walk across the room to change a song or pause playback. To work around it, we ended up connecting our laptop to the Hanwell and downloading an iPhone app, which allowed us to control iTunes with our phone remotely, thwarting Marshall’s attempts at getting our lazy bones off of the couch. You could also add on one of the myriad of wireless audio solutions that are available for smartphones and other audio devices, but doing so would only add to the total cost of the system, putting it further out of reach for many consumers. We refused to start testing the Hanwell with anything other than Bowie’s Ziggy Stardust period – the powerful, guitar-driven “Moonage Daydream” first on our list. We dialed up the EQ to give the bass some boost, cranked up the volume, and stepped back to hear how the little cab handled the tune. Immediately, we were struck by the crunchy goodness of the electric guitar, echoing wildly throughout the room with raw, overdriven tone. Along with the guitar, the 70’s percussion was also well done, with cleanly reproduced, thumpy toms, and a crushing snare. We found the crash cymbal work a little brittle, so we dialed back the responsive EQ’s treble dial to a little below 5, which did the trick. Moving on through other musical genres, we found the Hanwell’s 6-inch drivers put-out plenty of smooth and well-defined low end, and its ever-so-slightly dark tweeters aided in warm and present midrange and treble. There were several moments we paused to dwell on as the little box poured through powerful renditions of our favorite tunes. One particularly rich listening experience came with Ray Lamontagne’s “Beg Steal or Borrow.” The song entered with a sumptuously mossy groove in the percussion, the crushed snare and kick drum thudding with deep, organic resonance. The multiple guitars of electric and acoustic varieties were well defined in the mix, and there was an achingly smooth tone to the baritone guitar that gave an almost live presence to the song. As we listened on, the screaming, tubey tones of electric guitar solos continued to be one our favorite aspects of the Hanwell’s sound – not surprising, considering it looks just like a small guitar amp. It also continued to impress with its handling of percussion on nearly every genre. When “Feral” came on from Radiohead’s The King of Limbs, we actually had the impression that the entirety of the opening groove was bouncing off of a huge, imaginary speaker cone, almost tangibly before our ears. The clarity and textured dimension of the synthetic tones was really impressive, and we felt like Moog synthesizers and drum machines had been wheeled into our living room. Though we were thoroughly impressed with the Hanwell’s performance, we do have a few gripes to tender. At times, we wished for a little more clarity in the treble, especially at the very top end where brilliance is most easily sensed — but then again, we’d rather a speaker err on the warmer side rather than getting too sharp or shrill at the top end. We also felt that, in some tracks, there was a hint of a metallic tinge to the midrange. And, of course, we always long for more stereo separation from single-cabinet speakers such as these. Marshall says it will produce only around 10,000 numbered units of the Hanwell, giving it a collector’s item status. Still, as much as we enjoyed immersing ourselves in the Hanwell sound, the threadbare feature set and $800 sticker-shock-inducing price tag rob our enthusiasm, collector’s item or not. We really enjoyed our experience with the Hanwell, but we’re forced to wonder how it will fit into the incredibly competitive market of speaker docks, which seems to pack in more options and features with every incarnation. That said, if money is no object (or at least not too tall a hurdle) and you love rock-themed, retro-style gear, the Hanwell is a handsome little box with scene-stealing sound. Just remember what you’ll have to give up to get it – ah, the rock star’s dilemma.